The MIOPS app set up for active tracking of an object. Earlier this year I wrote about the MIOPS Mobile Remote and Mobile Dongle, devices that work with DSLRs from a variety of manufacturers to provide smartphone control of the complicated cameras. The company is back with a Kickstarter campaign for another accessory that DSLR photographers are going to want, the Capsule360 Motion Control Box. MIOPS has already blasted well past its $75,000 funding goal with a total of almost $315,000 at publication time with 16 days to go in the campaign. As you can see, individual MIOPS Capsule360s can be linked for very complex 3-axis motions. Add in an optional dolly or a motorized slider, and any DSLR can be controlled with the iOS app to do very precise and repeatable motions. No longer does astrophotography require a telescope mount; just place a few Capsule360s together and use the app to track a bright star. Combining 3 Capsule 360s, a slider and L-bracket for a full slide/tilt/pan motion controller. The app also allows control through face tracking, perfect for using a DSLR as a "robot-controlled cameraman" for a one-person studio. This feature alone would be great for situations where a person wants to film him or herself walking around, but can't afford to hire a cameraman. The battery life of each Capsule360 is about 8 hours while shooting videos, but up to 7 days while capturing motion time-lapse. 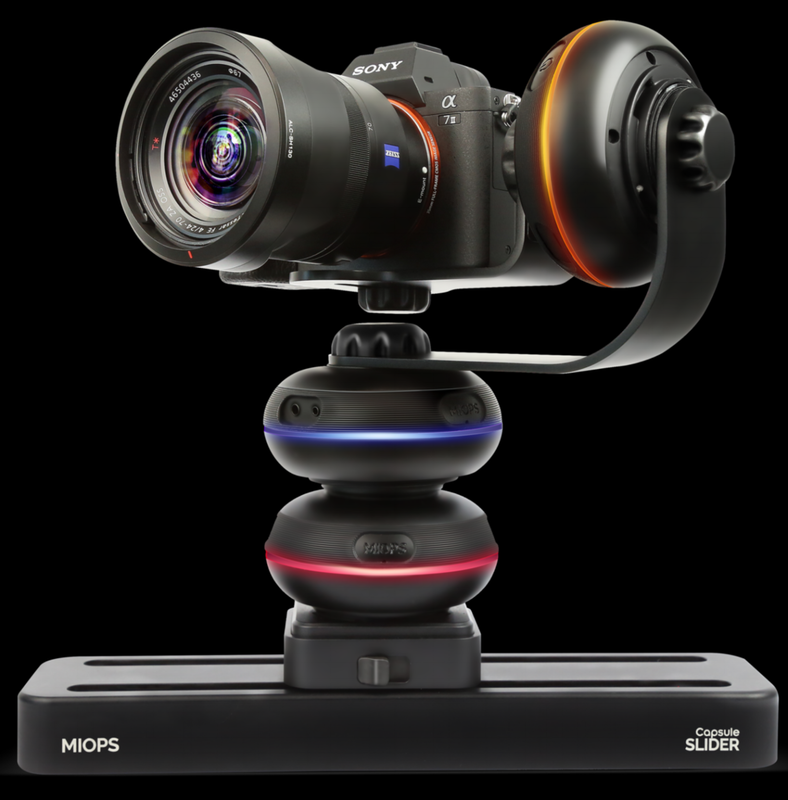 What's most impressive is that the premium pack right now is available for under $1,000 and includes three Capsule360s, a Capsule Slider, a Capsule Dolly, an L bracket (helpful for astrophotographers), a turntable kit and a Mobile Dongle. The team expects to deliver the first Capsule360 in December of 2018, and you can be a part of this exciting development.